Celebrating the life of Salvador Diaz, Sr.
Be the first to share your favorite memory, photo or story of Salvador. This memorial page is dedicated for family, friends and future generations to celebrate the life of their loved one. 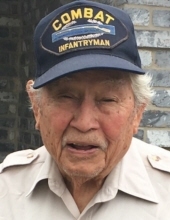 Obituary for Salvador Diaz, Sr.
Salvador Diaz, Sr., 97, of New Braunfels, passed away on Sunday, November 25, 2018 in New Braunfels. Born on June 3, 1921 in New Braunfels, he was the son of the late Francisco and Dolores Diaz. Salvador is survived by his wife, Sofia Diaz; children, Rachael Saenz and husband Raymond, Henry Diaz and wife Sandy, Salvador Diaz, Jr., and wife Maria, Gloria Ramirez and husband Armando, Hector Diaz and wife Sarah, Jesse Diaz and wife Carolyn, and Carol Ann Diaz; 25 grandchildren, and numerous great grandchildren. In addition to his parents, Salvador was preceded in death by his sons, Ramon and Oscar Diaz. Salvador was a proud World War II veteran in the United States Army and was a recipient of the Purple Heart. He retired from civil service at Randolph Air Force Base after a long career. His favorite pastime was being with his grandchildren and great grandchildren. A visitation will be held at the Lux Funeral Home Chapel on Thursday, November 29, 2018 from 5:00 p.m. to 9:00 p.m. with the Holy Rosary to be recited at 7:00 p.m. The Mass of Christian Burial will be celebrated at Holy Family Church on Friday, November 30, 2018 at 10:00 a.m. Interment will take place at Fort Sam Houston National Cemetery on Monday, December 3, 2018 at 9:15 a.m. Pallbearers will be, Raymond Saenz III, Christopher Diaz, Jesse G. Diaz, Armando Ramirez, Jr., Hector Diaz, Jr., Oscar Diaz, Jr., and Jeremy Diaz. To send flowers or a remembrance gift to the family of Salvador Diaz, Sr., please visit our Tribute Store. The Holy Rosary will be recited at 7:00 p.m.
"Email Address" would like to share the life celebration of Salvador Diaz, Sr.. Click on the "link" to go to share a favorite memory or leave a condolence message for the family.